Evergreen Turf has the ingenuity and experience to successfully complete any sports field project to meet your deadlines. Whether it is a tedious renovation, or an entire sports complex, from sod removal to custom grown sod, we are willing and able to go the extra mile. Using the latest planting methods we are equipped to manage your project more efficiently to ensure a state-of-the-art playing field. 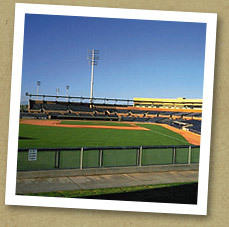 With dozens of sports fields to our credit, Evergreen Turf is known for exceeding expectations. No matter how large or small the job may be, we remain consistent in our ability to fulfill our customers' needs. Our clients include The Arizona Cardinals, Goodyear Spring Training (home of the Cincinnati Reds and the Cleveland Indians), Camelback Ranch Spring Training (Home of the LA Dodgers and Chicago White Sox), Big League Dreams Sports Park, and the REACH 11 Sports Complex.